Larry Elswick of Lake Metroparks (back left) joins the KS Team in accepting the Honor Award. 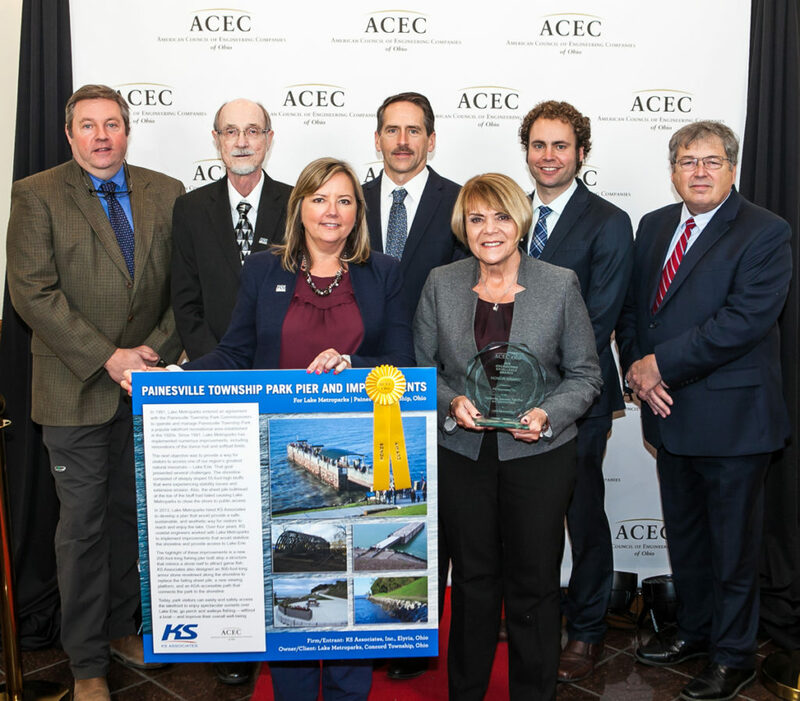 KS Associates received an Honor Award in the 2019 Engineering Excellence Awards competition sponsored by the American Council of Engineering Companies of Ohio (ACEC Ohio). KS Associates’ entry, the Painesville Township Park Pier and Improvements project submitted in the Recreation category, was recognized for its innovation, complexity, and value to the community. KS Associates was the lead engineering consultant for the project, under contract with Lake Metroparks. Prior to the improvements at Painesville Township Park, visitors had no access to Lake Erie. The park’s rocky shoreline and lack of a beach made it impossible to safely swim, walk along the shore, or launch a boat. Park visitors could only enjoy views of the lake from atop a 55-foot bluff. In 2013, Lake Metroparks hired KS Coastal Engineers to evaluate the park’s waterfront resources and structures. Over four years, the KS Team worked with Lake Metroparks to develop and implement a plan to stabilize the shoreline, reduce the bluff erosion, and design a pier that would provide access to Lake Erie. KS Associates designed a new 800-foot-long armor stone revetment along the shoreline to replace the failing steel sheet pile retaining wall, new stairs, an ADA-accessible path that connects the park to the shoreline, and the showpiece of the park — a 200-foot-long fishing pier. One of the most innovative aspects of the pier is its steel “crib” base filled with stone to mimic a stone reef, providing a natural habitat for small fish. These small fish attract larger game fish, making the pier the ideal location to catch walleye and perch — especially important for those with no access to a boat. The pier was officially opened to the public with a ribbon cutting ceremony in October 2017. Now, park visitors of all abilities have a way to access and enjoy Lake Erie. View our Painesville Township Park Pier and Improvements Project Page to learn more about the project. Congratulations to our friends and teaming partners who also won awards in the competition. Click here to view photos of the 2019 ACEC Engineering Excellence Awards Luncheon.